One of the main tasks confronting contemporary educators, is to maintain optimism and hope and be pro-actively creative amidst the bureaucracy and perfunctory processes of the university. Despite expectations to conform to institutional prescriptions, pedagogical tactics can be invoked, which can operate to repurpose the strategies and established practices of the learning environment. To develop this argument, the chapter will adapt and develop a range of concepts as pedagogic possibilities, associated with Gilles Deleuze (The Fold), Deleuze and Guattari (the Rhizome), Benoit Mandelbrot (Fractality) and Michel de Certeau (tactics). 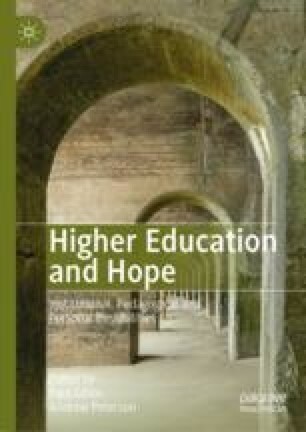 In so doing, the chapter will invite educators to investigate and facilitate the possibility of fostering alternative and ultimately creative and hopeful learning approaches (also incorporating bell hooks), that incorporate the unpredictable emergence and heterogeneous ruptures and Folds of individual learners. Through the development and suggested application of these concepts, the chapter will argue that beyond established curriculum and pedagogy, untapped spaces of collaborative hope and possibility can be recognised and embraced. In challenging and short-circuiting boredom-inducing prescriptions and closed-system learning environments, a more open-system and ‘process’ of knowledge-fluidity and nonlinearity can emerge. The possibility of uncovering and adapting dynamic learning spaces, with hopeful pedagogical tactics, means that flexible and creative practices can incite inner-worlds of unpredictable rhythm and articulation to emerge.